Easy for user to program it. All parameters can set by only 2 password. 1)R.O. parameter. & 2) pump electrical parameter. 4 key interface for onsite programming. process status massage on display. front panel LED indication for active device. There are three mode available Auto/Manual /auto MPV. Conductivity display with pre-alarm and trip setting. Voltage & individual current of all phase on display & also pump motor protection & also we give pump protection in manual mode. Long life & Maintenance free product. R.O. 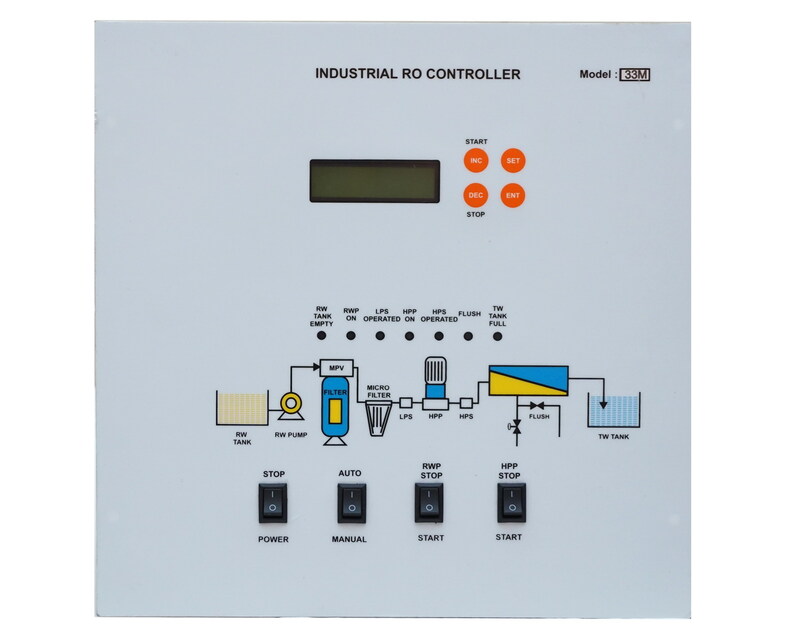 panel with 6 inputs And 4 outputs. Over Load & Under Load. Over Voltage & Under Volatge. Dry Run & Single Phase Preventer. Available in two size. 1) premium and 2) standard. push pull terminal for easy wiring onsite. Individual current measurement coil for every phase. In display show each phase of current separately. Working on 7 different mode in auto MPV. Backwash time alarm on display in manual mode.